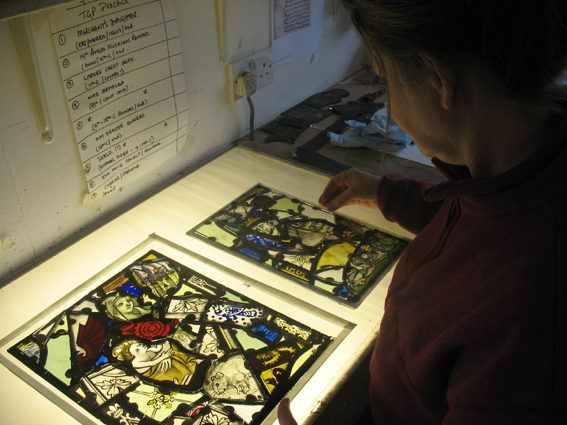 Setting out some glass on the cartoons we can get an idea of the size of the work and the scale we need to work to. We want the windows to have an instant impact but also to reward concentrated looking. It is great to have it all mapped out and to have some defined boundaries to work within. Rachel went up to Conwy last weekend with the valiant Carwyn, her husband and a carpenter, and Alun Adams from The Architectural Glass Company in Swansea. 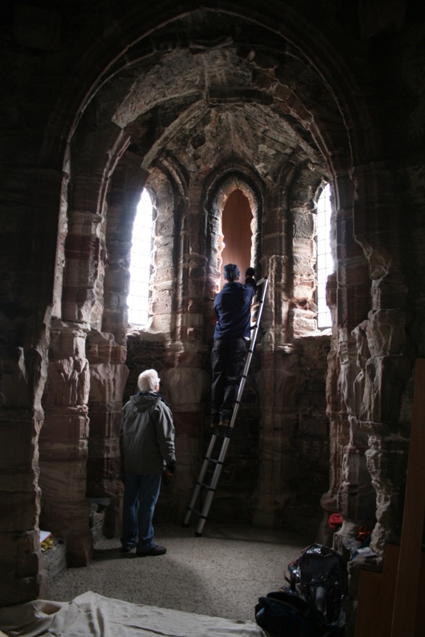 They made wooden templates that fit exactly into the 13th century glazing groove so that we can make our panels to fit exactly into the eroded stone openings. 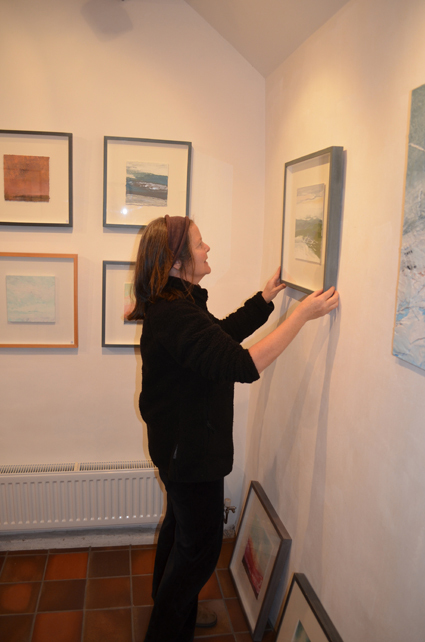 Now I have to leave all this and clear out our studio to hang my New Yearpainting show ready to open on 27th December. 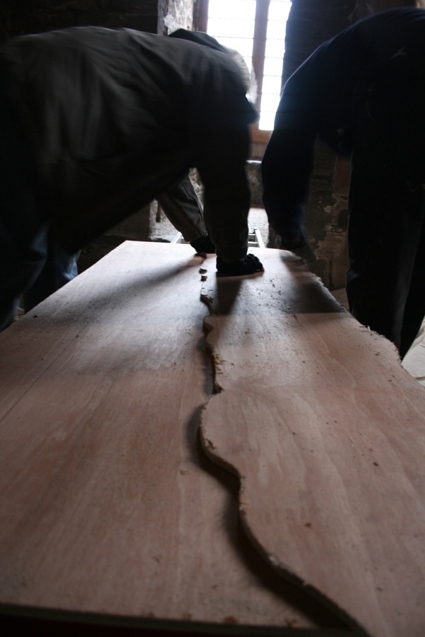 Things are going well with our Conwy Castle commission. Rachel and I are busy finalising the cartoons before we can begin cutting the glass for our windows. This involves drawing up more details and deciding on final positions. 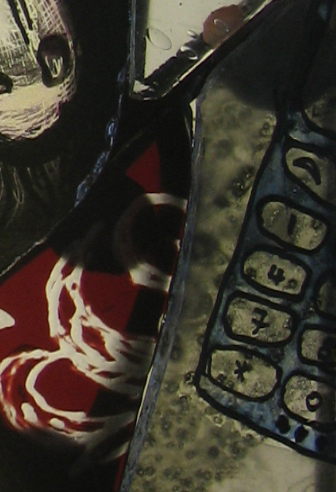 It is great to be collaborating with another artist, I am sure that the work will be all the richer for it. We have taken over my gallery as our studio and will be installing light boxes as soon as my New Year Exhibition is over. 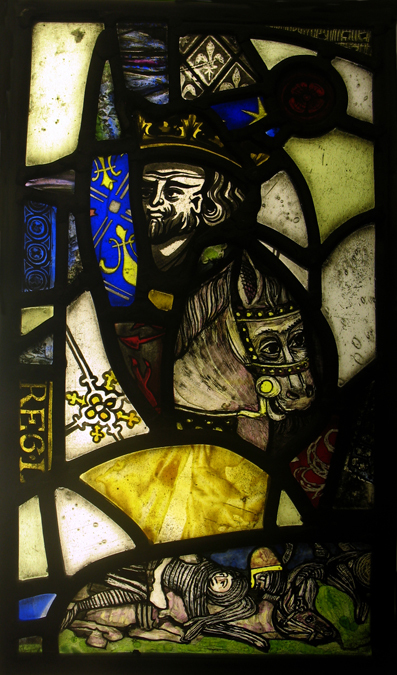 We are incorporating details from medieval sources, such as the horse above from stained glass from Llangwstenin Church in Gwynedd, and the portrait of Edward 1st from stained glass in York Minster. 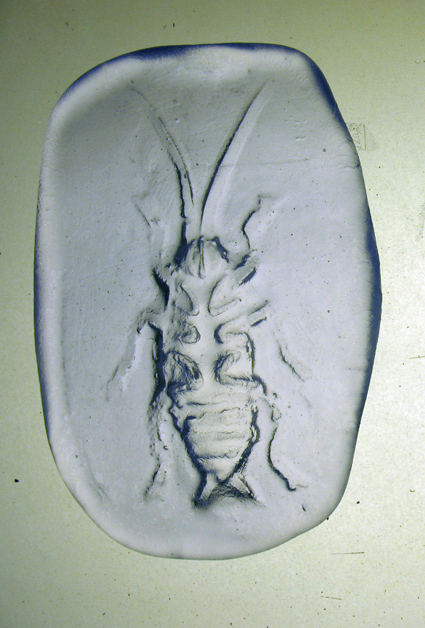 Meanwhile its going back to basics, doing painstaking colour and firing tests on my new enamels – I can’t wait to get started with the painting! 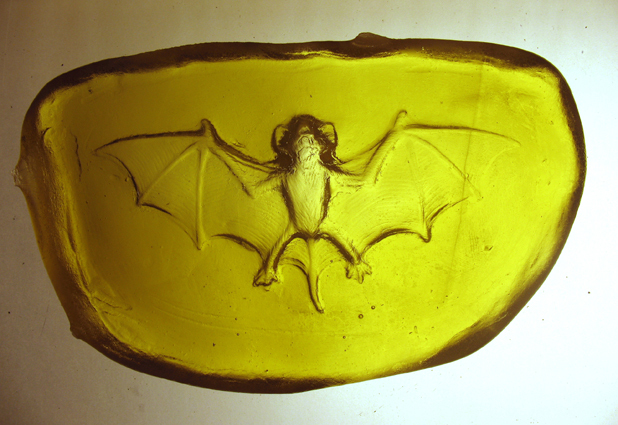 Having been shortlisted for the interpretive art commission for Conwy Castle (see previous post), I was so fired up by my site visit and by coming across the amazing mediaeval glass from Llanrychwyn and Llangwstenin Churches that I have been working flat out, day and night this past fortnight to put my proposal together. The commission is for an interpretive artwork that will tell the story of the Princes of Gwyneth and Edward the 1st and evoke life in the castle in the early mediaeval period. It is a visionary move on the part of CADW to employ artists to bring the castle to life, make it more welcoming and enhance the visitor experience – a welcome move away from dull interpretation boards. Refractory moulds ready to fire. 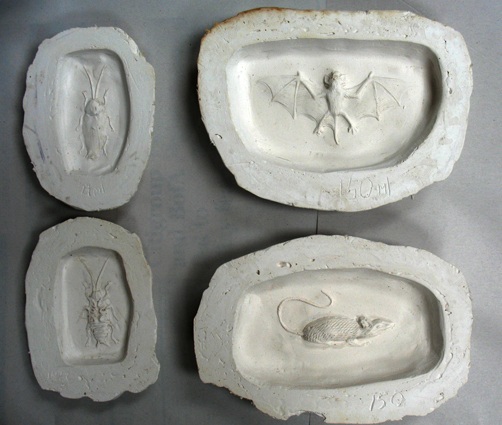 I started off making some open-face casts of rats and bats and bugs as samples of pieces that I could put in some of the stone niches around the castle. Lit from behind these would be of interest especially to younger visitors. 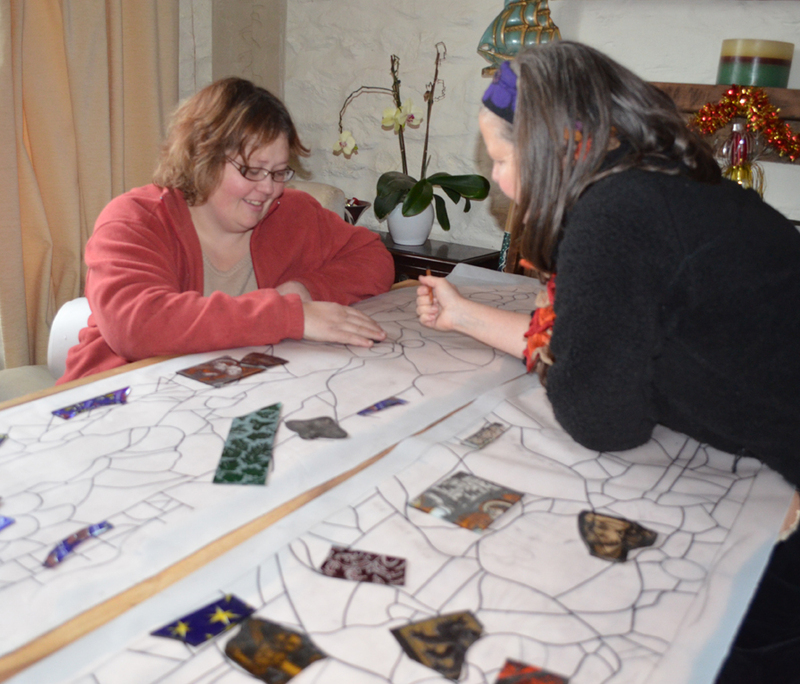 But I couldn’t get that stained glass out of my mind, so I went to see my friend, Rachel Phillips who is a glass painter and lives in my village and we started cooking up a proposal. 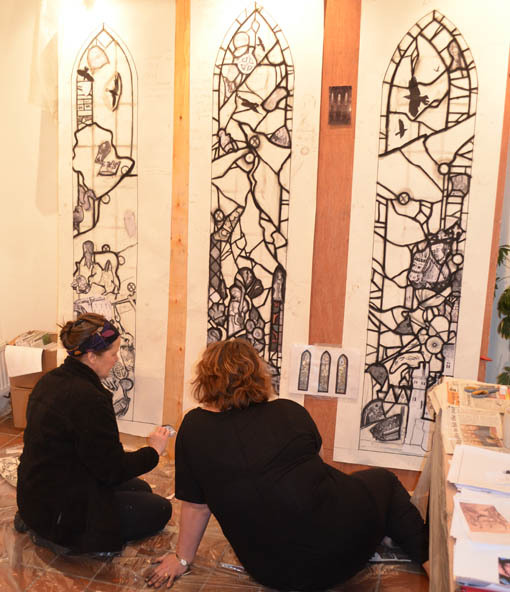 This resulted in us painting and fabricating two sample leaded panels of painted glass fragments that give an impression of the kind of styles and imagery we would incorporate into our panels. We have worked day and night on these panels and our proposal and I finally got them in the post yesterday. 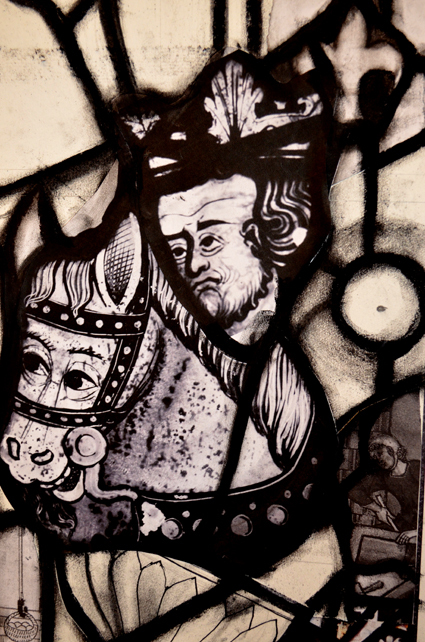 Inspired by the Llanrychwyn and Llangwstenin glass we are proposing to make three contemporary fragment panels for the Royal Chapel at Conwy based on mediaeval imagery from manuscripts and stained glass of the period, and incorporating landscape textures and details from the area. The project inspired us to do quite bit of research about the history of the period and about glass making across the ages. Rachel has studied this subject before, but we have both learned so much about Welsh history of the 13th and 14th Centuries. It is a fascinating era with intrigue and war, infidelities and jealousies…the whole works! It was an interesting period for glass as well with craftsmen often making glass on site for their windows, developing “flash” glass (clear glass with a thin layer of coloured glass on one side, made so as to achieve colour whilst maintaining light), and a whole range of influences coming in from Europe. 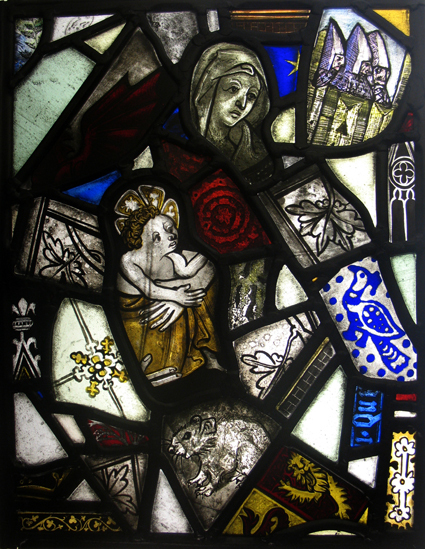 It has got me really interested in mediaeval glass and I am becoming addicted to Corpus Vitrearum Medii Aevi, the national database of mediaeval glass in Wales and England. I am suddenly noticing the influence of the mediaeval period in the most unexpected places! 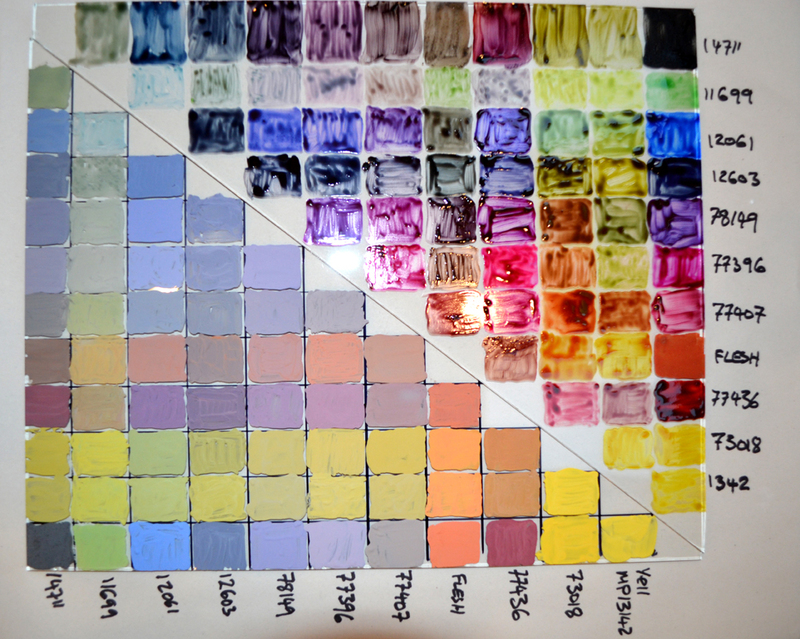 Stained glass seems such an appropriate medium for this project. The method and tools have hardly changed since ancient times, working in this way you feel in touch with the craftsmen of the time. 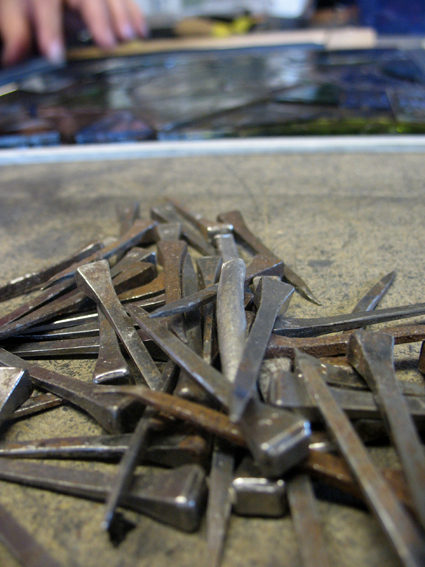 Stained glass artists today still use sheeps tallow, lead, and ancient-looking nails. It is a million miles from the digital age but I am interested in finding ways to use contemporary technology in the process. In the panels we included small fragments referencing modern life, part of a mobile phone, footballs incorporated into a border…developing these ideas needs more time, but we achieved a lot in 2 weeks, and I am very happy to be collaborating with such a talented artist and good friend.